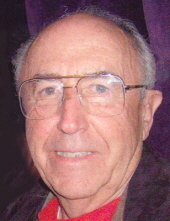 Age 90 of Traverse City, formerly of Burbank, California passed away Tuesday, February 5, 2019 at his home. Funeral Services will be held 1pm Saturday February 9, 2019 at Nelson-House Funeral Home, Owosso Chapel with Pastor Michael Hasselbring officiating. The family will receive friends at the funeral home from 11am until the time of service. Donald was born January 29, 1929 in Traverse City; the son of Henry and Marie (Fiebing) Hasselbring. He graduated from Traverse City High School; Class of 1947 and later earned his Master's Degree. Donald proudly served his country in the Navy Reserves and served 14 years. He married Judy Bugh on October 9, 1995 in Traverse City at their lake house. Donald was a member of Calvary Baptist Church and was a Sunday School teacher for over 50 years. He spent his days as a high school teacher for 25 years and a postman for 15 years. He loved to travel and he traveled the world twice. Donald loved taking photos and making movies of his adventures. Family was his true passion in life, he enjoyed taking his kids on tubing trips, bike rides and chasing them up and down Sleeping Bear Sand Dunes. He will always be remembered as a devoted husband and christian and a proud father and grandfather. Donald is survived by his wife Judy; his daughters Jennifer (Kirk) Ashmun, Lisa (Dan) Boles and Nicole Tobias-Paniagua; grandchildren Hannah, Kalob, Lauren, Madelyn, Danielle, Jaden, Gavin, Michael, Mark and baby Lisa; several nieces and nephews; special friends Norm and Shirley Kusche, John and Virginia Grande and Keith Robinson and many other loving family and friends. He was predeceased by his parents; four brothers and two sisters. Memorial contributions are suggested to Munson Hospice. To send flowers or a remembrance gift to the family of Donald Hasselbring, please visit our Tribute Store. "Email Address" would like to share the life celebration of Donald Hasselbring. Click on the "link" to go to share a favorite memory or leave a condolence message for the family.